Beautiful 3 bedroom apartment that combines all the elements to create an unforgettable vacation. Comfortable, private and a great location. 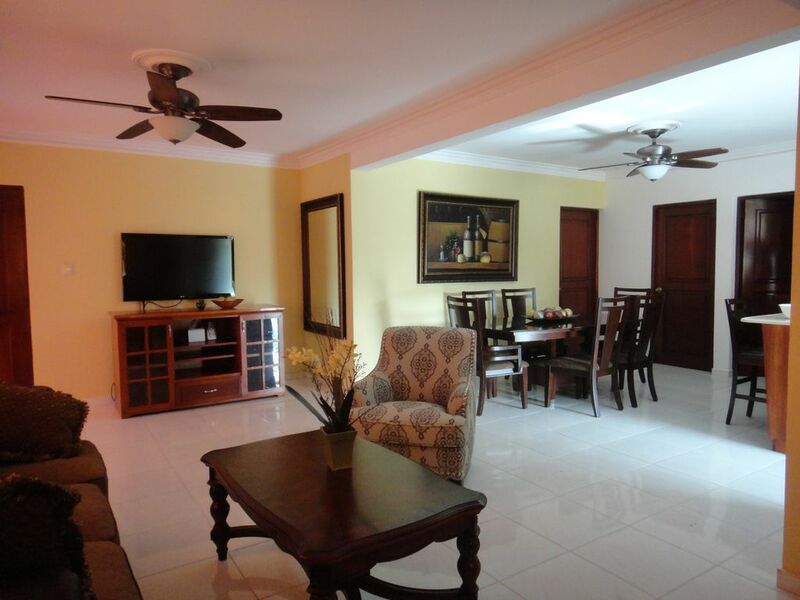 The property is an apartment located in a middle class neighborhood in the heart of La Romana. Here you can enjoy the warm love of the local people, learn about the culture and there everyday living. The beach is about 10 driving minutes to (BAYAHIBE), and 5 minutes away from Caleta Beach. Another local attraction are Las Maravillas Cave the first West Indies first natural museum of Repestrian artwork, located inside a 100,000 year old cave. The property is close to transportation, restaurants and local bars. The Apartment offers a spacious master bedroom and two guest bedrooms. A well equipped kitchen are also part of the amenities. I recommend you rent a car. The benefits of staying with us is that you are only minutes away from the city center but are not going to get overpriced on everything like in the tourists areas. You will only pay a fraction of what it will cost to stay at Casa De Campo and will only be 5 driving minutes away. Fantastic stay in La Romana! This very clean apartment is located in a quieter suburb near the Hospital Provincial Dr. Francisco A. Gonzalvo. 7 minutes drive to most downtown restaurants, 10-15 minutes to Casa de Campo. Access to the Circunvalacion is 10 mins away if you are heading to San Pedro de Macoris or Punta Cana. Plenty of space, very new furniture, extremely fast wireless internet. Power goes out for a few hours each day, which is typical for this region. A/C in all bedrooms kept us cool at night. Plenty of colmados in the area where you can walk to get ice cold Presidente. Ronny checked in on us during the stay, and the house caretaker was quick to respond with any concerns. Highly recommended for small groups, even if visiting for business. Matthew thank you for staying with us and I hope to meet your vacation home needs in the future. Nice location, spacious, & comfortable! We enjoyed our stay and felt safe and comfortable. The home was well-maintained and the owner was very accommodating, we had a issue with the Wifi and he had it fixed right away. The location was good for our trip and good for getting around. The home was very close to the city cars (public transportation) that we used for traveling around town which only cost 25 pesos per person...it was inexpensive and convenient. The bus system is very reasonable as well. We would recommend this property to friends and family. Thank you very much for choosing our home as your vacation home John & Rita. I'm glad you enjoyed your vacation & hope to see you back soon. Good value for nice apt, we would stay again. Ronny (the owner) was very helpful and very easy to work with. He arranged for an individual to meet us at the airport and show us to the apartment. He also arranged for a guide during our 8 day stay. I highly recommend everyone utilize these guides. Driving in the Dominican and in La Romana in particular, is a zoo. Crazy driving conditions that you cannot imagine until you experience it. We would not have found many, if not most of the things that we did without the benefit of our guide. Probably 90% of the roads in La Romana do not have street signs. The apartment was comfortable and met our needs. The apt is located in La Romona proper; we were likely the only visitors in our area. I suspect that this apartment is the nicest apt in the immediate area. We were more interested in allotting more of our vacation money to the excursions more so then our accommodations, and this apartment worked perfect for that goal. We did a ton of fun things while we were there. La Romona is a very good place to home base, as there are plenty of tourist type things in the immediate area, and we were there for 8 days. While the area is intimidating, after the first day we really did not feel that uncomfortable. I think that having the guide played a pivotal role in how well and how quickly we acclimated to our surroundings. The immediate neighbors that we met were all very nice and accommodating. The apartment is one of four apts that make up the building that Ronny owns. I understand that the other three are rented to Dominican residents. This apt is where Ronny and his family stay when they visits from NYC. The master bed is one of the most comfortable beds I have slept in. While the oven and microwave were not working, we managed just fine with the stove top. We refer to this vacation as an adventure as it was totally different than any of our other family vacations, and that is based on what we experienced in the Dominican Republic. Long and short, we would go back and we would not hesitate to rent from Ronny again and in particular this apartment. The photos and descriptions are an accurate and current depiction of the apartment. Ronny is very good to work with. The apartment met all my expectation and all rooms are well decorated. It provided a relaxing environment in which my family enjoyed our vacation.